Politics is the last thing saintly people would usually want to discuss about. Manipulative intrigues, bribery, abuses, cheating – every politician is forced to indulge in these things whether he or she likes it or not. Understanding the detrimental effects of discussing such subject matters, a spiritual seeker stays away from such discussions and practices. But in the Srimad-Bhagavatam we read about the famous Mahabharata character Vidura, who was eager to hear about a king and a politician known for his divine leadership qualities. Approaching his spiritual master, Maitreya Rsi, Vidura pleaded him to speak about the exceptional qualities and activities of the great king Prthu , who was also an empowered incarnation of the Supreme Personality of Godhead. 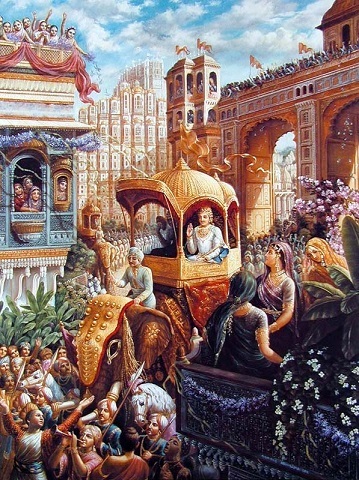 Vidura said, “Who is that intelligent person who will not want to hear about the activities of this king?” Srila Prabhupada explains that Vidura is setting an example for ordinary kings and executive heads that one should be eager to hear about Prthu Maharaja and follow in his footsteps. Delighted to hear this question, Maitreya begins his narration. 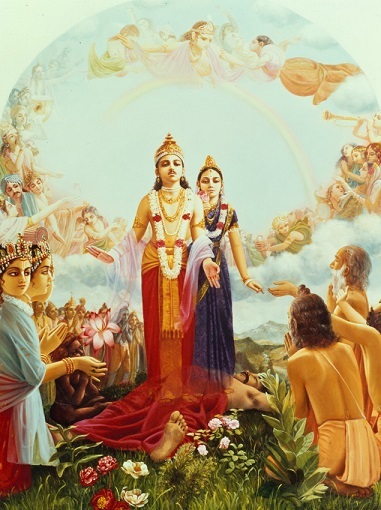 Based on this discussion, let us study some of the qualities of this great king and SaktyaveSa-avatara, who was endowed with the ruling potency of the Lord. Prthu Maharaja was born of the demonic king Vena, who was known for his cruel tyrannical rule. Fed up with this, the brahmanas killed Vena by chanting mantras and then churned his dead body to give birth to Prthu . From this we learn that even an inauspicious situation can be turned into an auspicious situation. Bhakti, or devotional service to Krsna, is the art of turning curses into blessings. One must learn to turn an inauspicious disgraceful situation into an auspicious glorious situation. When Prthu was coronated as the king, the professional reciters called as sütas and magadhas started singing his glorious qualities and activities. But Prthu stopped them, saying he was yet to display those qualities in his life. Modern politicians are eager to inform their subjects about their wonderful qualities and the great accomplishments they are going to bring about. And their foolish followers heap showers of praise on such leaders even if their leader is a criminal, to say nothing of possessing and displaying virtuous qualities. Such leaders must understand that their cheap followers are actually insulting them by glorifying them. And the followers must learn to carefully select their leader based on genuine qualities and activities. As soon as King Prthu assumed power, he started acting on his responsibilities. When he found out that the earth was not producing enough food grains to feed the population, he decided to teach her a good lesson. He took up his bow and arrow and was ready to kill her. Taking the form of a cow, mother earth started running all over the universe, but Prthu kept chasing her. Only when she begged forgiveness and promised to act properly did Prthu spare her life. Before every major election, it is common in India for political parties to spend crores of rupees in the name of development of the poor. Once a party comes to power, however, it conveniently forgets all the big promises it made before elections and remains busy exploiting the government facilities till the end of its tenure. Moreover, modern leaders have no idea of providing spiritual care for the masses. even if they seem to work for the welfare of the people, all their efforts ultimately fail because of lacking spiritual vision. Such leaders are advised to take lessons from Maharaja Prthu , who took care of the physical needs of his citizens but also gave spiritual instructions for their spiritual advancement. efforts to improve the physical needs without working on the spiritual needs are on the sentimental platform, whereas efforts to improve the spiritual needs without caring for the physical needs expose one’s hardheartedness and impersonal attitude toward people. Prthu Maharaja first took care of people’s physical needs, and thus they developed the receptivity to hear his valuable spiritual instructions. King Prthu had initiated the performance of one hundred aSvamedha sacrifices, which would result in great prosperity and welfare of the world. After successfully performing ninety-nine sacrifices, Prthu was eager finish the hundredth. But something unexpected happened when he was performing this last sacrifice: Indra, the king of heaven, in the guise of a sannyasi stole the horse. Prthu’s son quickly ran after Indra and brought the horse back. Prthu resumed his sacrifice, but Indra again appeared to spoil the show, and Prthu’s son brought the horse back. This happened several times, and every time Indra took various forms of holy men. This eventually became the origin of so many pseudo-religious societies and organization that propagate misleading theories in the name of religion and spirituality. Seeing Indra’s mischief, the King and the sages were about to kill Indra so they could perform the sacrifice peacefully. At that time, Lord Brahma appeared on the scene and advised Prthu to give up the idea of killing Indra. Since Prthu was already aware of the essence of all religious principles, Brahma advised, there was no need for him to perform the hundredth sacrifice. If he did, Indra would introduce many more irreligious principles that would cause further havoc in society. Most of us have a tendency to get carried away by the desire for name and fame while doing something. Allured by quick money, sport stars are often involved in match-fixing while politicians many times give priority to their personal interests over the interests of the country. Prthu Maharaja was submissive to receive feedback from others, and therefore he realized the dangerous consequences of his actions. He could appreciate Lord Brahma’s advice and could work upon it. By sacrificing his personal record of one hundred aSvamedha sacrifices for the sake of the world, Prthu was able to please Lord Vishnu by agreeing to cooperate with his superiors. Real sacrifice means sacrifice of the false ego, or the desire for personal prestige. His ninety-nine sacrifices involved sacrifice of material things; sacrifice of the false ego was the perfect completion of the whole project. 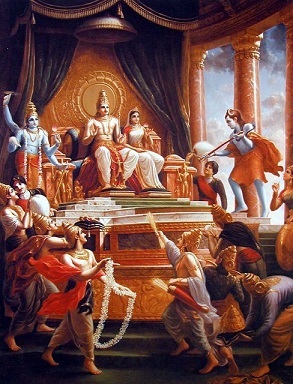 As a result of this act, Prthu Maharaja attracted the blessings of Lord Brahma and Lord Viñnu and became more famous than Indra, who is famous as Sata-kratuù, the performer of one hundred aSvamedha sacrifices. Blessings and well-wishes of the Lord and His devotees outweigh the fame and glory that come by selfishly pursuing personal ambitions. Ninety-nine is less than hundred by ordinary calculations, but ninety-nine can be far greater than hundred if we get the mercy and blessings of the Lord. In this episode, although Indra was the culprit because of his misbehavior, Lord Brahma didn’t rebuke him. Instead he admonished Prthu for persisting with his efforts to perform the hundredth sacrifice. The reason is that Indra was known for his stubborn nature; every time he feels threatened by a great king or a yogi, he does some childish mischief to stop their progress. But Prthu Maharaja, being a mature devotee, was expected to behave more responsibly. Lord Brahma trusted him more than Indra, and therefore advised him to remain satisfied with the number 99. Since Indra was playing an important role in the universal management, killing him in this sacrifice would be a big blunder. Lord Brahma thus demonstrated a very important quality of a great leader: how to bring the best in everyone. A leader should not reject his people when they commit mistakes but should adjust the situation in such a way that everyone gets to engage their skills properly for the sake of the mission. Short-sighted leaders tend to reject people with unconventional behavior or skills – eunuchs and gays, for example. They need to understand how every individual is precious and can contribute to the development of society. Followers, too, have a responsibility while choosing their leader: they shouldn’t choose a person based on his or her entertaining value. Good entertainers, whether movies stars or cricket starts, are good at entertaining people, but if you elect them to lead a nation, they will make a mockery of governance. The citizens of Prthu Maharaja were overjoyed upon seeing their King’s exemplary character of renunciation and obedience. Followers of a leader may follow someone after seeing his or her personal skills and charisma, but such followers are not true followers. As we often see in India, after every cricket match that India wins, cricket fans worship their heroes almost like God. But when the same Indian team loses a game, the followers treat their God-like stars like worthless animals. Leaders, therefore, should become a champion of character, and this will attract the hearts and surrender of all followers. everyone is eager to give advice; receiving advice and corrections appears too painful. Spiritually blind leaders are least bothered about the spiritual development of their subjects, and they consider spiritual advice impractical and even detrimental to their nefarious administrative schemes. 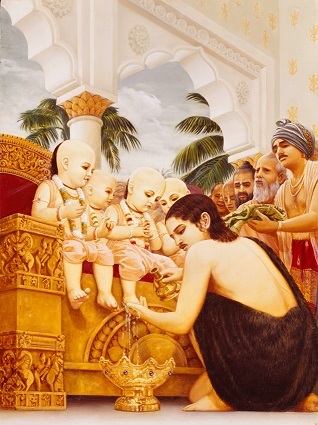 One time during Prthu Maharaja’s rule, the four child-sages, the Kumaras, entered his assembly. Immediately upon seeing them, Prthu gladly welcomed them and inquired about spiritual subjects and how to rule the kingdom in the best possible manner. His eagerness to take advice from the sages was greater than his eagerness to give advice to his citizens. This is another important quality of a leader: he always considers himself subordinate to the saintly people and is eager to render service to them. Such a person is fit to lead the entire world back to Godhead. Feeling extremely grateful for the guidance that the four Kumaras offered him, Prthu Maharaja offered his entire kingdom and treasury to them, saying they were the real owners of land and he was just their servant using everything for the welfare of the state. India ranks first in having the largest amount of black money deposited in Swiss banks: more than one trillion dollars! Imagine how much development this money can bring about if it were used properly. Greed is a terrible evil that can mar the character of a leader. Carefully guarding against it, a king or a leader must engage in profuse charity and employ his wealth for the welfare of his citizens. Modern politicians have a lot to learn from Prthu . Without waiting for people to revolt against him, a king or a leader should retire from active politics at the right time and hand over the responsibilities to his successors. Maitreya Rñi concluded his discussion by saying that everyone, including pure liberated souls, must hear, chant and induce others to hear about the activities of Prthu Maharaja. Simply by hearing the activities of Prthu Maharaja, one will achieve all material prosperity in this world and ultimately he goes back home back to Godhead. To summarize, a true leader acts as a humble servant – servant of God and all living entities. Leadership is actually a wonderful opportunity to serve. True leaders, like King Prthu , are not eager to become leaders, but their selfless service automatically puts them in a leadership position. We shouldn’t be attached to the position of a leader. We should be attached to the service that we can render as a leader. Radhika Vallabha Dasa has done his electrical engineering from IIT Bombay. He serves as a resident monk at ISKCON Mumbai. He teaches KRñna consciousness to college students.